Home » Bible Prophecy » Jacob Report #6 – When is the Battle of Gog & Magog? Jacob Report #6 – When is the Battle of Gog & Magog? The Question – When is the battle of Gog/Magog? I heard my first teaching on Ezekiel 38-39 as a teenager. A visiting prophecy teacher regaled us with the story of the coming battle of Gog and Magog. I remember clearly his confident assertions; “This is undoubtedly the next prophetic event to be fulfilled! Russia is going to sweep down upon Israel! The United States and Britain will stand up to defend Israel.” This was in the early 1960s, before Vietnam. Now it is 2012 and its déjà vu all over again. Iran is in the news, again. A number of skilled Bible prophecy teachers have identified Persia as one of the cohorts of Gog and Magog (Ezekiel 38:5) and have seen this as indicative that Iran and Russia are about to link up! In the past two months I have attended two major conferences, both well attended, which pointed to the two chapters of Ezekiel 38-39, to derive clues regarding the now, certainly imminent, battle of Gog of the land of Magog. In this Jacob report, I am going to make a case that the battle of Gog/Magog is not anywhere in the near future! In fact, it is at least 1000 years in the future! I will seek to prove from scripture that this battle of Gog/Magog is the final battle the Earth will ever witness, the war to end all wars, after which Satan will be cast, once and for all, into the Lake of Fire. Revelation 20:3, 7-10 (NASB) 3 and he threw him into the abyss, and shut it and sealed it over him, so that he would not deceive the nations any longer, until the thousand years were completed; after these things he must be released for a short time. 7 When the thousand years are completed, Satan will be released from his prison, 8 and will come out to deceive the nations which are in the four corners of the earth, Gog and Magog, to gather them together for the war; the number of them is like the sand of the seashore. 9 And they came up on the broad plain of the earth and surrounded the camp of the saints and the beloved city, and fire came down from heaven and devoured them. 10 And the devil who deceived them was thrown into the lake of fire and brimstone, where the beast and the false prophet are also; and they will be tormented day and night forever and ever. The purpose of this Jacob report is to prove the battle of Gog/Magog described in Ezekiel 38-39 is the same battle which occurs after the Millennium when Satan is released for a short time. All I want to know is when? Interpreting Bible prophecy has one element that other portions of scripture do not. History is in the past. Principles of truth are universal for all generations at all times. However, prophecy by its definition (unfulfilled prophecy) is in the future. It is predicted, but has yet to occur. Yet, with every attempt to “hear” and “understand” is the requirement to attempt to put the item – morsel – of prophetic utterance into context. That frequently leads to speculation as to when the specific prophetic event is to take place. It is my conviction that to simply say “That’s in the future. When it happens, we will know!” is inadequate. I maintain we are expected to know the prophecies that are yet to occur, and to recognize events and individuals as they appear on the scene of world events. That is, I believe, the reason such a wealth of information is available for our understanding, as revealed by the Holy Spirit. We are unfaithful stewards if we fail to take full advantage of every bit of detail and knowledge He has so generously provided to us in His word. 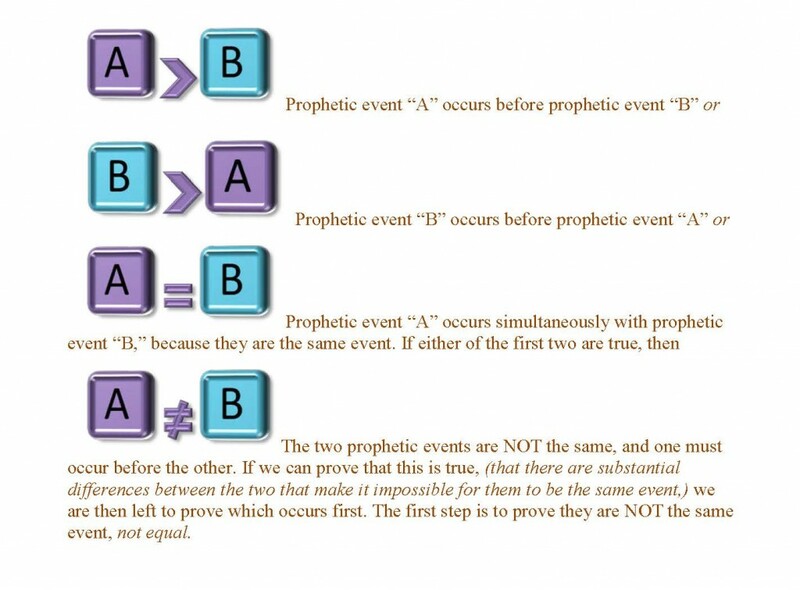 When it comes to time, it may be impossible to say with certainty when specific prophesied events (the rebuilding of the Temple, the abomination of desolation) are going to happen; but I do believe, and am convinced, it is possible to order events in relation to other events. I will include two examples; one is from scriptures. One isn’t. Three couples are standing in line at the movie theater waiting to buy tickets. They arrived early so they are the only ones in line. Each couple consists of one man and one woman (hey, these days in California you have to say). Each woman stands in front of her date. Sue is not immediately in front of Roger in line. Joe is last in line. Sally has a guy in front of her. Sally in not with Joe. Betty used to date Ken, but they broke up, so she refuses to stand next to him. Roger is too easily influenced by Ken, so he makes sure he buys his ticket before Ken. Construct the line of six people and thereby determine who is dating whom. The above puzzle is typical of one you would see on either an LSAT test or GRE exam (Law School Admissions Test or Graduate Record Exam). It is solvable from the information provided and the answer is; Betty, Roger, Sally, Ken, Sue, Joe. What, you may ask, does this have to do with understanding Bible prophecy? Everything! Let me start with three things certain to transpire according to biblical prophecy. The Second Coming, the anti-Christ sits in the Temple declaring himself deity, and the Temple is rebuilt. You would be hard pressed to tell me the exact date these things will transpire, but you could arrange them in order. First, the Temple is rebuilt. Then, the anti-Christ sits in the Temple. Finally, the Second Coming takes place. This is not difficult because anti-Christ cannot sit in the Temple until it is rebuilt, and he is destroyed at the Second Coming of Messiah. The evidence for ordering these three events is detailed by Paul in 2 Thess. 2:1-8. The point to be made here is that there is more than one way to tell time. It’s one thing to say, “I was born Wednesday at 3 PM on March 24, 1948.” It’s another, just as correct, way to state, “I was born after World War II, before Israel became a nation, eighteen months before my wife was born, while Truman was president, and my father was 25.” Although the date and hour of biblically prophetic events may not be spelled out with a calendar, as in “the Second Coming will occur on the __th of ____ at ___ Greenwich Mean Time, 2____,” there are many things that can be determined as to the order of events in relation to other prophetic events. I not only believe this is possible, I believe it is encouraged for the citizens of the kingdom who are part of the last eventful generation. Here is a helpful definition of terms. Our task is to determine “when” the battle of Gog/Magog is to occur in relation to other known prophetic events, and to see if it is possible to conclude that the battle of Gog/Magog in Ezekiel 38-39 is the same as = (equals), the battle of Gog/Magog of Revelation 20:7-10. There are distinct differences between A & B. The Zechariah battle/war/invasion is NOT the same as the battle of Gog/Magog. There are significant and substantial differences between the two which can only be explained if they are two separate conflicts. The first clear difference is the FOCUS of the attack. The attack described by Ezekiel is focused on “Israel.” Consider Ezekiel 38:18, “It will come about on that day, when Gog comes against the land of Israel,” . . . . Eighteen times “Israel” is named–the people, “the land of,” “the house of”–in Ezekiel 38-39 while Jerusalem is not named once. In contrast, the attack/war/battle/invasion described in Zechariah is focused on Jerusalem and Judah! In Zechariah 12-14, twenty-three times Jerusalem is named and identified as the target, center of conflict and final resolution, while Israel is only mentioned once. In the first sentence of Zech. 12:1, “The burden of the word of the LORD concerning Israel.” So it concerns Israel, BUT Israel is NOT the focus of the conflict. The focus of the Zechariah conflict is Jerusalem and Judea. Some will say this is a distinction without a difference. I strongly disagree. There is an unambiguous account of the suffering and tragedies inflicted upon the Jewish people in the Zechariah invasion account. Zechariah 14:2 (NASB) For I will gather all the nations against Jerusalem to battle, and the city will be captured, the houses plundered, the women ravished and half of the city exiled . . .
Zechariah 13:8 (NASB) “It will come about in all the land,” Declares the LORD, “That two parts in it will be cut off and perish . . .
Now contrast this with the Jewish casualties cited in the Ezekiel conflict. There are NONE mentioned! NONE! No fatalities, no word of destruction in or to the land or people. In Zechariah, the tragedy and extent of Jewish suffering during these “birth pangs of the Messiah” lead directly to a spirit of grace being poured out upon the seed of Abraham and repentance accompanied by recognition of the Messiah, Yeshua. Zechariah 13:1, 9 (NASB) 1 “In that day a fountain will be opened for the house of David and for the inhabitants of Jerusalem, for sin and for impurity. Zechariah 12:10 (NASB) ”I will pour out on the house of David and on the inhabitants of Jerusalem, the Spirit of grace and of supplication, so that they will look on Me whom they have pierced; and they will mourn for Him, as one mourns for an only son, and they will weep bitterly over Him like the bitter weeping over a firstborn. Contrast this “National Revival” with the two chapters of Ezekiel where NO repentance is mentioned and NONE is asked for, anticipated, or required! YET, three times in the two chapters of Ezekiel, the Lord uses the phrase, “My people Israel” (Ezek. 38:14 &16; 39:7). Pardon me if I get ahead of myself but this term of complete identification and “ownership” (i.e. “My people Israel”) indicates to me that the time of repentance and reconciliation between Adonai and His people Israel (described in Zechariah 12-14) has ALREADY happened when the Ezekiel conflict occurs! Ezekiel 38:14 (NASB) ”Therefore prophesy, son of man, and say to Gog, ‘Thus says the Lord GOD, “On that day when My people Israel are living securely, will you not know it? Ezekiel 39:7 (NASB) “My holy name I will make known in the midst of My people Israel; and I will not let My holy name be profaned anymore. And the nations will know that I am the LORD, the Holy One in Israel. 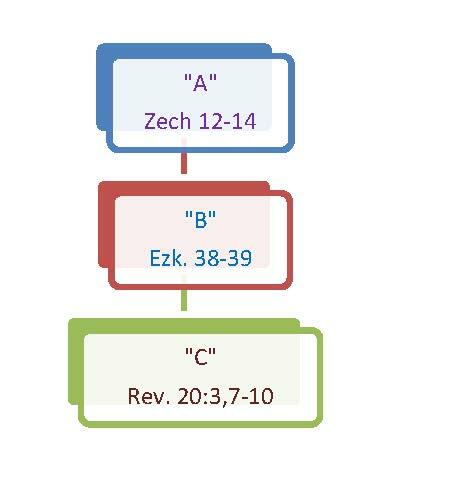 I believe this is enough to prove the point that the two conflicts predicted in Zechariah 12-14 and Ezekiel 38-39 are two DIFFERENT conflicts which are NOT concurrent. In other words, they DO NOT occur at the same time. Proof that |B>A| cannot be true and, in fact, is false. Ezekiel 38-39, the battle of Gog/Magog, cannot occur before Zechariah 12-14. Let us start this section by taking up where we left off in the last. In the Ezekiel 38-39 account, as we have already seen, the Lord asserts ownership over the people and land of Israel (“My people Israel”). From Zechariah 13:9, we have the information that this identification/ownership is a direct result of the national repentance. Also, remember once again that in the entire account of Ezekiel 38-39, there is not one mention of, or any request for, repentance on the part of Israel. This is totally unique in the prophets. Consider two examples from Jeremiah as the Babylonian captivity looms. Jeremiah 25:29-30 (NASB) ”For behold, I am beginning to work calamity in this city which is called by My name, and shall you be completely free from punishment? You will not be free from punishment; for I am summoning a sword against all the inhabitants of the earth,” declares the LORD of hosts.’ ”Therefore you shall prophesy against them all these words, and you shall say to them, ‘The LORD will roar from on high And utter His voice from His holy habitation; He will roar mightily against His fold. He will shout like those who tread the grapes, Against all the inhabitants of the earth. Perhaps Ezekiel wasn’t as specific or as graphic when proclaiming the sins of the nation as was Jeremiah? Not true! Consider just one example. And yet, in the entire two chapters of Ezekiel 38-39 there is not one threat or accusation from the Lord’s prophet toward Israel, not one request for repentance! 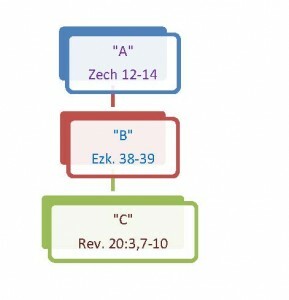 Clearly, the objective reader would have to conclude that the Zechariah 12-14 events (including the national repentance) have preceded the Ezekiel 38-39 events. The next item of evidence we have is the description of Israel as a land without walls, bars, or gates. Is there any rational or objective observer of Israel and its political situation that would actually believe there will be a time prior to the Second Coming of Messiah when this land will live without walls, bars, and gates? The Ezekiel verse could not be clearer; entire villages without walls, bars, or gates. Why are there no bars/walls/gates? Because the people are absolutely secure! Ezekiel 38:8 (NASB) “. . . but its people were brought out from the nations, and they are living securely, all of them. Ezekiel 38:14 (NASB) ” . . . ‘Thus says the Lord GOD, “On that day when My people Israel are living securely, will you not know it? “. . . when they live securely on their own land with no one to make them afraid. Are we actually to believe, as many maintain, that the tragic events described in Zechariah 14:2, occur after this period of peace? IMPOSSIBLE! I conclude this section with the following verse and one final, very important, point. Ezekiel 39:7 (NASB) ”My holy name I will make known in the midst of My people Israel; and I will not let My holy name be profaned anymore. And the nations will know that I am the LORD, the Holy One in Israel. I maintain that this verse is the most important verse in the entire two chapters of Ezekiel for identifying the actual time this battle of Gog/Magog occurs. Contrast this proclamation “I will not let My holy name be profaned anymore” with the following verse. Isaiah 52:5 (NASB) Again the LORD declares, “. . . My name is continually blasphemed all day long. I maintain that this proclamation by the Lord could not be made during the events of Zechariah 12-14, not even at the Second Coming! Why? Because at the Second Coming, Lucifer is chained up and cast into the bottomless pit, but only for a thousand years! Immediately upon his release, he commences to organize the last great rebellion. Revelation 20:8 (NASB) and will come out to deceive the nations which are in the four corners of the earth, Gog and Magog, to gather them together for the war; the number of them is like the sand of the seashore. One final thought. It would be impossible for the battle of Gog/Magog, which concludes with the above proclamation, to occur before the Zechariah chapters because the spiritually dark condition of the Jewish nation and the people entails the perpetual blasphemy of the Holy Name of Messiah Yeshua all day, every day. This will continue until the promised national repentance occurs as described in Zechariah. Therefore, the events of Ezekiel 38-39 ending with the proclamation, “I will not let My holy Name be profaned anymore,” must occur after Zechariah 12-14, and cannot occur before. The battle of Gog/Magog in Ezekiel 38-39 is consistent with the battle of Gog/Magog in Revelation 20:7-10. The number of the invading troops is described. Fire from heaven destroys invaders. Revelation 20:9 (NASB) And they came up on the broad plain of the earth and surrounded the camp of the saints and the beloved city, and fire came down from heaven and devoured them. Ezekiel 38:22 (NASB) “With pestilence and with blood I will enter into judgment with him; and I will rain on him and on his troops, and on the many peoples who are with him, a torrential rain, with hailstones, fire and brimstone. Ezekiel 39:6 (NASB) ”And I will send fire upon Magog and those who inhabit the coastlands in safety; and they will know that I am the LORD. Note the complete absence of any request for Israel’s repentance as a pre-condition for deliverance in EITHER the Ezekiel passage OR the Revelation passage! Why? The answer is obvious: National repentance occurred previously in connection with the Second Coming. Thereafter the nation and people live in a condition of grace and peace accompanied by security as guaranteed by the King himself. There is a complete absence of any request for deliverance in behalf of or by Israel in either Ezekiel or Revelation. Another proof that in both cases, the nation and the people live in a state of complete security. Zechariah 14:11 (NASB) People will live in it, and there will no longer be a curse, for Jerusalem will dwell in security. Security is an important part of the inheritance of the repentant nation which at last lives in the fullness of the covenant to Abraham, Isaac, and Jacob. There is no longer any need to request deliverance, for the security of the nation and the city of Jerusalem is guaranteed. Ezekiel 38:14 (NASB) “Therefore prophesy, son of man, and say to Gog, ‘Thus says the Lord GOD, “On that day when My people Israel are living securely, will you not know it? There is a complete absence of Jewish fatalities or casualties mentioned in either the Ezekiel or Revelation account. Of course not, for they are living in security with Israel’s Messiah and King ruling from Zion. Isaiah 2:2-3 (NASB) Now it will come about that In the last days The mountain of the house of the LORD Will be established as the chief of the mountains, And will be raised above the hills; And all the nations will stream to it. And many peoples will come and say, “Come, let us go up to the mountain of the LORD, To the house of the God of Jacob; That He may teach us concerning His ways And that we may walk in His paths.” For the law will go forth from Zion And the word of the LORD from Jerusalem. Additional evidence is apparent within Ezekiel 38-39 in light of a post-Millennium fulfillment. The armies of Ezekiel 38/39 are equipped with bows and arrows/war clubs and shields/chariots and horses. Ezekiel 39:3 (NASB) ”I will strike your bow from your left hand and dash down your arrows from your right hand. Ezekiel 39:9 (NASB) ”Then those who inhabit the cities of Israel will go out and make fires with the weapons and burn them, both shields and bucklers, bows and arrows, war clubs and spears, and for seven years they will make fires of them. Ezekiel 39:17, 20 (NASB) 17 “As for you, son of man, thus says the Lord GOD, ‘Speak to every kind of bird and to every beast of the field, “Assemble and come, gather from every side to My sacrifice which I am going to sacrifice for you, as a great sacrifice on the mountains of Israel, that you may eat flesh and drink blood. 20 “You will be glutted at My table with horses and charioteers, with mighty men and all the men of war,” declares the Lord GOD. The world does not learn war anymore. There is no heavy field artillery or armored vehicles, and certainly no aircraft or nuclear weapons. All knowledge of advanced weaponry has been obliterated during the thousand years of peace. Isaiah 2:4 (NASB) And He will judge between the nations, And will render decisions for many peoples; And they will hammer their swords into plowshares and their spears into pruning hooks. Nation will not lift up sword against nation, And never again will they learn war. After a thousand years of peace, when Satan is released from his prison, he finds a lot of willing followers ready to participate in a rebellion against the center of world government in Israel. However, these recruits have lost all the skills of “advanced weapons and warfare.” They have no option but to use the most primitive weapons of old; bows and arrows, shields and swords, chariots and horses. One of the most interesting weapons enumerated by Ezekiel is the buckler. It is defined as “a small, round shield held by a handle or carried or worn on the arm.” It is used for close contact sword upon sword conflict, and you would be hard-pressed to find it in use in the 21st century anywhere in the world. Even in the poorest and most primitive nations of Africa (such as Somalia, Chad, etc. ), the warlords’ weapons of choice are AK-47’s and RPG’s, and Jeeps mounted with 50 caliber machine guns, but not bows, arrows, and war-clubs, horses and chariots (and bucklers)! The weapons of the invaders rely heavily on wood. Ezekiel 39:9-10 (NASB) ”Then those who inhabit the cities of Israel will go out and make fires with the weapons and burn them, both shields and bucklers, bows and arrows, war clubs and spears, and for seven years they will make fires of them. ”They will not take wood from the field or gather firewood from the forests, for they will make fires with the weapons . . . This particular point has a twofold implication, indicating once again that we are addressing a time in the future after the Millennium. The first point is that these weapons are wood and not just symbolism for today’s weapons of advanced metals; so much wood that it provides fuel for seven years such that no additional firewood from the forests will be required. The second point: Israel is burning wood as a primary source of fuel! Israel today relies upon coal and petroleum products, both fuel oil and natural gas products, almost exclusively as its source of electricity to generate heating. In fact, wood is scarce! It is too valuable to burn! Most construction today in Israel is concrete block and steel frame. Interior wood framing and support, common in USA residential construction, is almost never seen in the desert areas of the Middle East where wood is scarce and highly coveted. It would be unheard of to burn wood as a primary source for heating. Ezekiel 39: 10 (NASB) ”They will not take wood from the field or gather firewood from the forests . . .
Once again, this is not describing Israel today, but a post Second Coming, post Millennium, post iPod, environmentally recovered, agricultural civilization which has gotten back to the basics. The purpose of the battle of Gog/Magog (Revelation 20:3, 7-10) is explained and found in Ezekiel 38-39. My wife asked me a very good question. “If Satan is locked up, why does the Lord permit him to be released after 1,000 years? Why not just throw him into the Lake of Fire with the Beast and false prophet and skip the Millennium altogether?” I know my wife isn’t the first one to ask that question. In order to answer and to uncover the details provided in Ezekiel 38-39, we need to review other scriptures which reveal details of that mysterious period of time known as the Millennium. The Millennium, the 1000 year period beginning with the Second Coming of Messiah Yeshua, is possibly the least understood period of time in all of biblical eschatology (prophetic end-time events). Here are a few of the highlights as revealed in scripture. It is a thousand year period, beginning with the Second Coming and the capture and confinement of the great adversary, Lucifer. His capture and confinement is one of the key elements that distinguish this period of time. Revelation 19:11&20 (NASB) 11 And I saw heaven opened, and behold, a white horse, and He who sat on it is called Faithful and True, and in righteousness He judges and wages war. 20 And the beast was seized, and with him the false prophet who performed the signs in his presence, by which he deceived those who had received the mark of the beast and those who worshiped his image; these two were thrown alive into the lake of fire which burns with brimstone. Revelation 20:1-3 (NASB) 1 Then I saw an angel coming down from heaven, holding the key of the abyss and a great chain in his hand. 2 And he laid hold of the dragon, the serpent of old, who is the devil and Satan, and bound him for a thousand years; 3 and he threw him into the abyss, and shut it and sealed it over him, so that he would not deceive the nations any longer, until the thousand years were completed; after these things he must be released for a short time. At the end of the 1000 year period, Satan is released. Satan immediately organizes a last great rebellion among the nations with the stated goal of overthrowing the King who rules in Zion. THIS is the last great battle of the Earth, the battle of Gog and Magog. Revelation 20:8-9 (NASB) And will come out to deceive the nations which are in the four corners of the earth, Gog and Magog, to gather them together for the war; the number of them is like the sand of the seashore. And they came up on the broad plain of the earth and surrounded the camp of the saints and the beloved city, and fire came down from heaven and devoured them. Apparently Lucifer is selling the story that the 1000 year rule of Messiah as King has been “oppressive.” What’s more, he accumulates many followers who buy in to this “plot” to overthrow the King. Where do these great numbers of followers come from? There are survivors who remain following the events of the Day of the Lord, the Second Coming. Zechariah 14:12-16 (NASB) 12 Now this will be the plague with which the LORD will strike all the peoples who have gone to war against Jerusalem; their flesh will rot while they stand on their feet, and their eyes will rot in their sockets, and their tongue will rot in their mouth. 16 Then it will come about that any who are left of all the nations that went against Jerusalem will go up from year to year to worship the King, the LORD of hosts, and to celebrate the Feast of Booths. Those who are left, who have survived, will be few in number and rarer than gold. Isaiah 13:9-12 (NASB) 9 Behold, the day of the LORD is coming, Cruel, with fury and burning anger, To make the land a desolation; And He will exterminate its sinners from it. 10 For the stars of heaven and their constellations Will not flash forth their light; The sun will be dark when it rises And the moon will not shed its light. 11 Thus I will punish the world for its evil And the wicked for their iniquity; I will also put an end to the arrogance of the proud And abase the haughtiness of the ruthless. 12 I will make mortal man scarcer than pure gold And mankind than the gold of Ophir. Those who remain will live much longer lives. In fact, if a person doesn’t make it to 100, they will be considered cursed. Isaiah 65:20-25 (NASB) 20 “No longer will there be in it an infant who lives but a few days, Or an old man who does not live out his days; For the youth will die at the age of one hundred And the one who does not reach the age of one hundred Will be thought accursed. 21 “They will build houses and inhabit them; They will also plant vineyards and eat their fruit. 22 “They will not build and another inhabit, They will not plant and another eat; For as the lifetime of a tree, so will be the days of My people, And My chosen ones will wear out the work of their hands. 23 “They will not labor in vain, Or bear children for calamity; For they are the offspring of those blessed by the LORD, And their descendants with them. 24 “It will also come to pass that before they call, I will answer; and while they are still speaking, I will hear. 25 “The wolf and the lamb will graze together, and the lion will eat straw like the ox; and dust will be the serpent’s food. They will do no evil or harm in all My holy mountain,” says the LORD. There will be decisions for this post Second Coming population. There will be opportunities to make the wrong decisions and those decisions will have consequences. Zechariah 14:16-19 (NASB) 16 Then it will come about that any who are left of all the nations that went against Jerusalem will go up from year to year to worship the King, the LORD of hosts, and to celebrate the Feast of Booths. 17 And it will be that whichever of the families of the earth does not go up to Jerusalem to worship the King, the LORD of hosts, there will be no rain on them. 18 If the family of Egypt does not go up or enter, then no rain will fall on them; it will be the plague with which the LORD smites the nations who do not go up to celebrate the Feast of Booths. 19 This will be the punishment of Egypt, and the punishment of all the nations who do not go up to celebrate the Feast of Booths. The key decision will be whether or not to worship and honor the King in Jerusalem. To do so the growing population amongst the nations must “go up” to Jerusalem to learn about the Lord as well as to worship Him. Isaiah 2:2-4 (NASB) 2 Now it will come about that In the last days The mountain of the house of the LORD Will be established as the chief of the mountains, And will be raised above the hills; And all the nations will stream to it. 3 And many peoples will come and say, “Come, let us go up to the mountain of the LORD, To the house of the God of Jacob; That He may teach us concerning His ways And that we may walk in His paths.” For the law will go forth from Zion And the word of the LORD from Jerusalem. 4 And He will judge between the nations, And will render decisions for many peoples; And they will hammer their swords into plowshares and their spears into pruning hooks. Nation will not lift up sword against nation, And never again will they learn war. There will be warnings from the Lord that consequences are attached to disrespecting the King, the Son of the Living God. Psalm 2:6-12 (NASB) 6 “But as for Me, I have installed My King Upon Zion, My holy mountain.” 7 “I will surely tell of the decree of the LORD: He said to Me, ‘You are My Son, Today I have begotten You. 8 ‘Ask of Me, and I will surely give the nations as Your inheritance, And the very ends of the earth as Your possession. 9 ‘You shall break them with a rod of iron, You shall shatter them like earthenware. '” 10 Now therefore, O kings, show discernment; Take warning, O judges of the earth. 11 Worship the LORD with reverence And rejoice with trembling. 12 Do homage to the Son, that He not become angry, and you perish in the way, For His wrath may soon be kindled. How blessed are all who take refuge in Him! The national salvation of Israel and the Jewish people has occurred during the “birth pangs of the Messiah,” the time of Jacob’s Trouble. The “special relationship” with His people was made secure once and for all during the difficult days leading up to His Glorious Return. Joel 2:31-32 (NKJV) 31 The sun shall be turned into darkness, And the moon into blood, Before the coming of the great and awesome day of the LORD. 32 And it shall come to pass That whoever calls on the name of the LORD Shall be saved. For in Mount Zion and in Jerusalem there shall be deliverance, As the LORD has said, Among the remnant whom the LORD calls. There were many fatalities amongst the Jewish people during this time of trouble, but Jacob has been saved out of it. Jeremiah 30:7 (NKJV) 7 Alas! For that day is great, So that none is like it; And it is the time of Jacob’s trouble, But he shall be saved out of it. The large numbers of casualties during Jacob’s Trouble, although painful, will eventually lead to an especially close relationship with His people. Those who remain in Jerusalem will be especially blessed. Isaiah 4:1-6 (NASB) 1 For seven women will take hold of one man in that day, saying, “We will eat our own bread and wear our own clothes, only let us be called by your name; take away our reproach!” 2 In that day the Branch of the LORD will be beautiful and glorious, and the fruit of the earth will be the pride and the adornment of the survivors of Israel. 3 It will come about that he who is left in Zion and remains in Jerusalem will be called holy—everyone who is recorded for life in Jerusalem. 4 When the Lord has washed away the filth of the daughters of Zion and purged the bloodshed of Jerusalem from her midst, by the spirit of judgment and the spirit of burning, 5 then the LORD will create over the whole area of Mount Zion and over her assemblies a cloud by day, even smoke, and the brightness of a flaming fire by night; for over all the glory will be a canopy. 6 There will be a shelter to give shade from the heat by day, and refuge and protection from the storm and the rain. The knowledge of this special relationship between the King and His relatives in Israel will be common knowledge among the rest of the nations. Therefore, for the citizens of these other nations truly seeking to understand the ways of this King and His Kingdom, it will be natural to reach out to the Jewish people. Though the opportunities to turn to the Messiah and King will be plentiful and widely available during this 1000 year period, correct choices are still required. Unfortunately, not every citizen of the planet will welcome this 1000 year period of peace during which the knowledge of the Lord shall fill all of the Earth. Were that the case, Lucifer would have no success in gathering recruits for his last great rebellion. Regrettably, he has no trouble gathering a multitude of followers from among the nations. Dr. Michael Rydelnik in his lecture, “The Coming Muslim Invasion” pointed out, quite correctly I believe, that the nations cited in Ezekiel 38 are today conspicuously all Islamic countries. Although he didn’t venture a personal opinion as to when he believed the Ezekiel 38-39 battle would occur, he assumed this “roll call” of presently Muslim nations would lead to a “Muslim” invasion (at some time before the Second Coming). I believe there is another explanation. The thesis put forward in this Jacob Report is that the battle of Gog and Magog in Ezekiel 38-39 is the same battle of Gog and Magog as predicted in Revelation 20:7-10. If my thesis is correct, how do I explain the list of “aggressor nations” which are all today pointedly Islamic? If there is a religion today that can be identified as the purest form of Satan’s own, it is Islam. Consider that the religion supports murder, lying, deceit, and making war. Who is the murderer from the beginning and the father of lies? Who goes about seeking whom he may devour? I consider it absurd when some ill-informed Christians suggest that Allah is “just another name for God.” Is God opposed to Himself? Can He not make up His mind? Islam says that Ishmael is the promised seed of Abraham and that the Jews are the counterfeits. Actually, Islam has quite a few more unpleasant things to say about Israel and the Jewish people which we’re all aware of. No, Allah isn’t “just another word for God” but is THE word for the god of Islam, and that god is Lucifer, pure and simple. The millions of Muslims worldwide and their governments are collectively committed to the destruction of both Israel and the Jewish people. They are completely in agreement with their god who desires to, in some way, nullify the plans of the One True God. Of course, they will fail, and their god will be chained up and locked away at the Coming of the Jewish Messiah and King, Yeshua. What will happen to the religion of Islam at His Coming? Let us recall from Zechariah. Zechariah 14:4&9 (NASB) 4 In that day His feet will stand on the Mount of Olives, which is in front of Jerusalem on the east; and the Mount of Olives will be split in its middle from east to west by a very large valley, so that half of the mountain will move toward the north and the other half toward the south. 9 And the LORD will be king over all the earth; in that day the LORD will be the only one, and His name the only one. No more Buddha, no more Vishnu, no more Mohammad, and no more Allah! However, at the end of the thousand years, Lucifer is released. Where do you think he will go first when seeking “allies” in his great plan to incite a rebellion, the LAST rebellion, the battle of Gog and Magog? Logically, he will visit the decedents of his former followers, the disciples of his religion. Islam is gone, and Mohammad is long since forgotten. You could say these lands and peoples have been swept and are clean—just as the scripture states! Remember, during this 1000 year period, choices are still being made. Though every opportunity exists to “go up” and submit and learn about the King and His ways, some will elect not to. And, when Lucifer is released, he will find a group of jealous, envious, descendants of the previously Islamic nations who are ripe for the deceiver and his plot. The details are contained in Ezekiel 38-39. What is the end of this matter? Revelation 20:10 (NASB) 10 And the devil who deceived them was thrown into the lake of fire and brimstone, where the beast and the false prophet are also; and they will be tormented day and night forever and ever. The battle of Gog and Magog leads to the salvation of the Gentile nations. As we recall, the hard times of Zechariah 12-14, alternately known as “the Birth Pangs of the Messiah” and/or “Jacob’s Trouble,” lead to the national repentance and salvation of Israel, and the complete salvation of the surviving remnant of the Jewish people. Zechariah 12:10 (NASB) 10 “I will pour out on the house of David and on the inhabitants of Jerusalem, the Spirit of grace and of supplication, so that they will look on Me whom they have pierced; and they will mourn for Him, as one mourns for an only son, and they will weep bitterly over Him like the bitter weeping over a firstborn. This will fulfill the promise which Paul so tenaciously clung to, the ultimate and complete salvation of his nation and his people. As the difficult time of Jacob’s Trouble results in repentance and the salvation of Israel and the Jewish people, the battle of Gog and Magog leads to the complete salvation of the nations. Ezekiel 39:7 (NASB) 7 “My holy name I will make known in the midst of My people Israel; and I will not let My holy name be profaned anymore. And the nations will know that I am the LORD, the Holy One in Israel. As we have previously seen, the period of 1000 years was a period of choice among the peoples of the nations. Not all made the right choices and, in fact, once Lucifer has been released, he immediately finds large numbers of willing accomplices in his great rebellion. BUT this is the last time such a rebellion will ever occur, for it is a demonstration to the rest of the gentile peoples and nations that Yeshua alone is Lord, the Holy One of Israel. THIS is the moment when all doubts are forever erased. This is the moment when the nations KNOW He is the Lord. Salvation is to the Jew first, and also to the Gentiles. Romans 1:16 (NIV) 16 I am not ashamed of the gospel, because it is the power of God for the salvation of everyone who believes: first for the Jew, then for the Gentile. As a consequence of the battle of Gog and Magog after the Millennium, crucial lessons are learned. The apparent lack of intervention by Adonai during the centuries past was neither a demonstration of His impotence nor due to a lack of compassion on His part for a people He had identified as His own. In fact, HE gave them into the hand of their adversaries because they acted treacherously against Him. He had hidden His face from their cries. All the suffering of the Jewish people and the exile of the nation from the land promised was as result of their own disobedience. In contrast, when Israel’s national repentance occurred (Zechariah 12-14) at the Second Coming, they truly were secure forever after, and certainly never in any danger from the massive invasion of Lucifer and his minions (Ezekiel 38-39, Revelation 20:7-10). The complete and absolute rout of the assault is proof to the Gentiles that Israel never had to endure national disgrace, pain, and suffering. The record has been set straight. Adonai was ALWAYS capable of deliverance. Let there be no mistaking the facts. The historic and repeated suffering of the Jewish people was NOT His choice. The pain and suffering was a result of their own bad choices. It certainly was not due to the superior strength of their Gentile adversaries, nor was it due to His unconcern with their suffering at the hands of those who hated them without a cause. Ezekiel 39:28 (NASB) 28 “Then they will know that I am the LORD their God because I made them go into exile among the nations, and then gathered them again to their own land; and I will leave none of them there any longer. The Diaspora, Israel’s forced removal and exile from the land promised to Abraham, Isaac, and Jacob was as a result of their own sin. It was not without His knowledge that they were exiled over the centuries, but at His hand! Likewise, their restoration to this land promised is also at His hand! Not one of them will be excluded from this land of promise. Ezekiel 39:26-29 (NASB) 26 “They will forget their disgrace and all their treachery which they perpetrated against Me, when they live securely on their own land with no one to make them afraid. Ezekiel 39:22 (NASB) 22 “And the house of Israel will know that I am the LORD their God from that day onward. All is forgiven. Immediately following the death of Jacob, Joseph’s brothers came to him with extreme apprehension. They considered that perhaps, with their father dead, Joseph would take the opportunity to “settle the score” for their conspiracy and the kidnapping which had brought him to Egypt (Gen. 50:16-21). Joseph reassured them with tender words of forgiveness. Likewise, after 1000 years of peace and prosperity under Messiah’s rule, all thoughts of any repressed grievance are fully put to rest when their Beloved Brother and Messiah instantly quashes the terrific attack of Gog and Magog and speedily dispatches Lucifer to the Lake of Fire to conclude this final battle. What does Occam’s razor have to do with the battle of Gog and Magog? Occam’s razor (also written as Ockham’s razor) is the English equivalent of the Latin lex parsimoniae—the law of parsimony, economy, or succinctness. It is a principle urging one to select among competing hypotheses that which makes the fewest assumptions and thereby offers the simplest explanation of the effect. 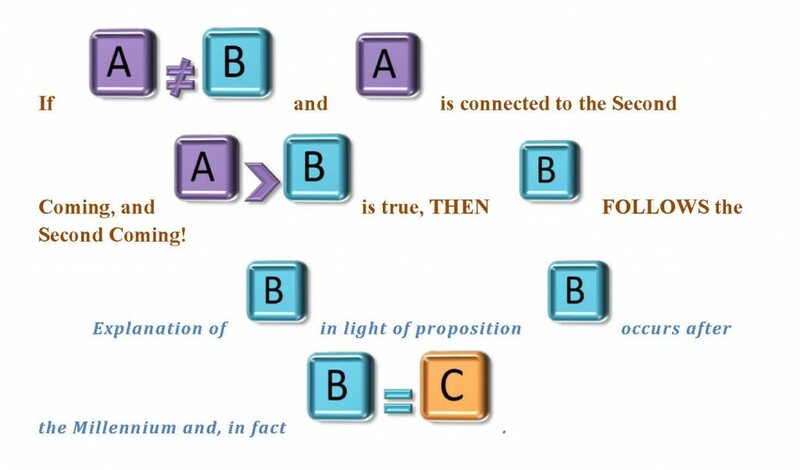 The principle is often summarized as “Other things being equal, a simpler explanation is better than a more complex one.” In practice, the application of the principle often shifts the burden of proof in a discussion. 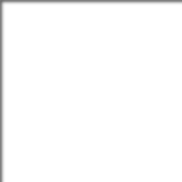 The razor asserts that one should proceed to simpler theories until simplicity can be traded for greater explanatory power. For decades, would be Bible prophecy teachers have expended great energy in speculating as to the “time” of Ezekiel’s predicted battle of Gog and Magog. Without exception, they start with the conclusion that it must be coming soon! To my knowledge, not one of these speculators has entertained the most obvious conclusion of all. The battle of Gog and Magog occurs exactly when John says it will, at the end of the Millennium! It is the most obvious conclusion to come to. No need for two when one will do! The diligent Bible student would have to start with this conclusion and find a reason why there must be a separate, second battle with the same name! All of the evidence presented in this Jacob Report points to the simplest conclusion–there is only one battle of Gog and Magog, and it occurs at the end of the Millennium when Lucifer is released and organizes his last great insurrection against the Kingdom of God.